A feeding tube is a medical device that is used to feed an individual who is unable to take food by mouth safely. This difficulty may be due to difficulty swallowing, an altered level of consciousness, an eating disorder, or other issues that make eating challenging. There are multiple types of feeding tubes and many reasons why a feeding tube may be needed. Each situation is different, and the decision to have a feeding tube placed permanently is a very different thing than allowing a temporary tube to be in place. To make a well-informed decision about feeding tubes, it is necessary to understand what a feeding tube is, the differences between types of feeding tubes, when a tube is necessary versus optional, and how these tubes are put in place. A feeding tube is a plastic tube that is used to bypass chewing and swallowing in a patient who is not able to eat or drink safely. These tubes can be used to deliver both food and fluids, and can also be used for providing medications when needed. A feeding tube can also be used to remove fluids from the stomach if the body isn’t processing stomach contents well. Feeding tubes are good for more than providing food, they can also relieve gas and bloating, and reduce nausea and vomiting. Providing Nutrition: Food, in liquid form, can be provided through a feeding tube. 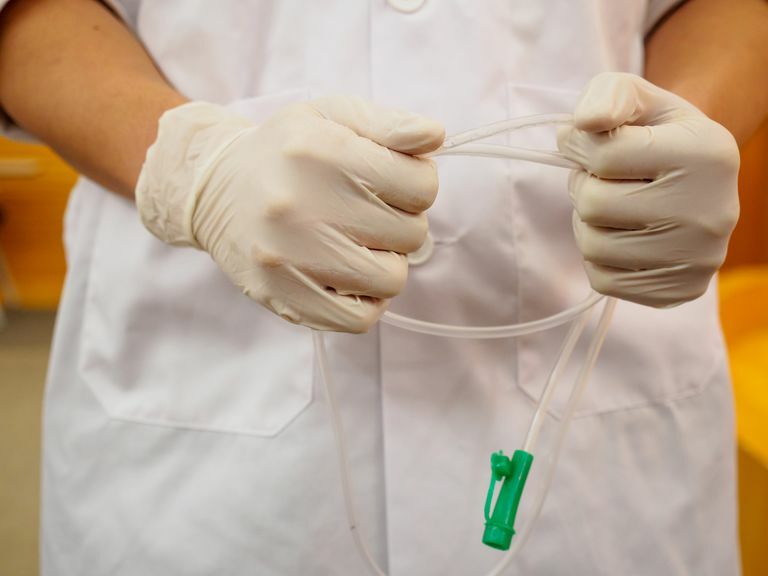 Tube feeding, or enteral nutrition, can be given through the tube to provide carbohydrates, protein, and fats to the body without requiring the patient to swallow or chew. Providing Fluids: Water can be provided through a feeding tube to keep the patient hydrated without needing to give IV fluids. Providing Medication: Medications, including many pills and tablets, can be given through a feeding tube. Tablets may require grinding and some capsules may need to be opened, but if the particles are small enough most medications can be blended with water and administered through a feeding tube. Decompressing the Stomach: Some types of the feeding tube can be used to remove air from the stomach. Some types of feeding tubes, the temporary ones, in particular, can be connected to suction to gently remove gas from the stomach to reduce distention and bloating. Removing Stomach Contents: If you aren't processing food or fluids, you may have food sitting in the stomach that causes discomfort, nausea, vomiting or stomach pain and bloating. Gentle suction can be used to remove fluids and small particles of food from your stomach. A feeding tube is necessary when you cannot safely take food or fluids by mouth. While it is possible to give fluid and nutrition through an IV, the body does better with food being delivered to the gut than into the blood vessels. Whenever possible, it is safer and better for the body to receive food and fluids in the stomach for normal digestion, but if you have difficulty swallowing, this may not be safe. Trouble swallowing can mean the patient chokes on food and fluids, or they “go down the wrong pipe” and things are inhaled into the lungs instead of being swallowed. This can lead to serious illness, including pneumonia, from the food particles entering the lungs. Others may be too sick to swallow, or are on the ventilator with a tube inserted into the airway that prevents swallowing. Some patients are alert and oriented but have lost the ability to swallow well. Still, others have a disease or illness that makes it difficult to swallow, such as oral cancer. The decision to place a feeding tube is a complicated one and is made more difficult if the patient is not able to participate in the discussion or hasn't yet shared their wishes regarding their healthcare. In many cases, a patient who needs a feeding tube is either sedated or unconscious and is unable to share their wishes with friends and loved ones. The question of what the patient would want, and whether the tube is likely to be temporary, long-term or permanent requires consideration. Some families spend days discussing the decision amongst themselves or may have a family meeting with medical staff to discuss the decision. In many cases, the decision to place a feeding tube is coupled with the decision to place a tracheostomy, a hole in the throat through which a ventilator can support your breathing. This is because intubation, the process in which a tube is inserted into the mouth and down into the airway so a ventilator can be used, can only be used for a few weeks until the damage can occur in the throat. Since these things are both within a two-week time limit, the placement of a tracheostomy and a gastric tube are often done at the same time or within a few days of each other. There are multiple types of feeding tubes, and they are used for a variety of conditions. The nature of the problem that is causing difficulty swallowing, also known as dysphagia, will help determine the type of tube that is used. Some are intended to be temporary, and others are meant to be long-term or even permanent. A temporary feeding tube, which is one that is inserted into the nose or mouth, down the throat, and into the stomach (G-tube) or deeper into the intestine (J-tube), can only safely stay in place for about fourteen days. Placement via the throat longer than two weeks increases the risk of erosion of the delicate tissues of the throat and esophagus. This can lead to permanent issues such as damage to the voice box and throat. A long-term or permanent feeding tube is one that is intended for use for months, years or even permanent placement. Like the temporary tube, these tubes can be removed if they are no longer needed but can remain in place for extended periods of time without risk to the mouth, throat, and esophagus because of food moves directly into the stomach. Nasogastric (NG) Tube: This type of tube is inserted into the nose, down through the throat, down through the esophagus into the stomach. It can remain in place for approximately two weeks before it must be removed or replaced with a long-term feeding tube. Orogastric Tube (OG): The same type of tube as a nasogastric tube, the tube is inserted into the mouth, down the throat into the esophagus and end rests in the stomach. This tube can also remain in place for up to two weeks when it must be removed or replaced with a permanent tube. A temporary feeding tube is inserted into the mouth or nose, down the throat, into the esophagus and then the end rests in the stomach (G-tube) or the middle of the small intestine (J-tube). These types of tubes have a radio-opaque tip, meaning there is a small amount of material that allows them to be detected on x-ray at the end of the tube. After placement, an x-ray is done, and that allows proper placement to be confirmed before the tube is used. Gastric Tube (G tube): This type of tube allows for direct access to the stomach through an incision in the left upper side of the abdomen. This tube completely bypasses the mouth and throat and allows for food, fluids, and medication to be given without swallowing. Jejunostomy Tube (J tube): This type of tube is similar to the gastric tube, being placed through an incision in the abdomen that is lower than G-tube placement, and allows for direct access to the jejunum which is the middle third of the small intestine. This tube tends to be smaller than the G-tube, which can limit what can be infused to thin liquids and finely ground powdered medications. Percutaneous Endoscopic Gastrostomy (PEG): This term is often used interchangeably with G-tube, but this actually refers to the technique used to place the G-tube. Percutaneous (through the skin) endoscopic (using a lighted endoscope) gastrostomy (placing a surgical hole in the stomach) describes the procedure used to place the G-tube, not the G-tube itself. The procedure to place the gastric tube is typically a quick one, and may or may not require anesthesia depending on your condition. In very ill patients in intensive care, no additional sedation may be required to place the tube at the bedside. The endoscope is a long thin instrument with a light and a camera on the end that allows the provider to watch the procedure on a monitor. The scope is inserted into the mouth, down the throat, and into the stomach. Once in the stomach, it is actually possible to see the light from the scope shining through the skin of the abdomen, showing the gastroenterologist where to make the incision. A small incision is made approximately half an inch long, through which the flexible tubing is put in place. Older G-tubes may have a balloon that keeps the tube in place. The outside portion of the tube has a cap that allows the tube to be opened, and for food and fluids to be gently pushed through the tube into the stomach. With good tube care, the incision will close more tightly around the tube, and any leaking of food or fluid that occurs in the days immediately following the procedure should be minimized with healing. While the incision is healing, a bandage with a slit in it is placed around the tube. This helps absorb any fluid that may leak from the site. If drainage is present and irritating the skin, a barrier ointment may be used for protection. Gently washing the site with soap and water and rinsing soap residue from the area is often all the care the site needs. Long term, many patients require no ointment or gauze at the site, but some prefer a dressing in case there is drainage to prevent skin irritation or clothes from being soiled. The removal of a feeding tube that is temporary is both quick and easy. It may be irritating to the delicate tissues of the mouth, throat, and nose, but this is typically minimal. To remove the tube, the tube is cleared of food and fluids, with a large syringe made for use with a feeding tube. It is then gently pulled out, taking 3-5 seconds to steadily be removed. If the tip of the tube is intact, demonstrating that the entire tube has been successfully removed, it is thrown away. If you regain the ability to eat and drink well, it is possible to remove a “permanent” feeding tube. Surprisingly, the procedure is quick, and while there is some pain, it is typically moderate and brief. Practitioners vary in their requirements for having a tube removed; some may require you to maintain your weight for at least a month while taking all food and fluid via the G-tube, while others may require a longer period of time. Once the decision is made to remove the tube, the tube can be pulled out, but this does require some degree of force to be used. The patient usually has a disposable towel held near the site, and the provider grasps the tube firmly and pulls steadily but firmly to remove it from the site. If there is a balloon on the inside of the stomach, it is deflated prior to removing the tube, but most types have a flange rather than a balloon and this step is not needed. The process does typically sting, and there is a small amount of blood in some cases, but the pain passes quickly. You may expect the incision to be sewn closed, but this is not necessary, and a clean dressing is more than adequate to keep the patient’s clothes clean in the days that follow if there is any drainage. The incision usually closes within a week of the tube being removed. The decision to place a feeding tube is not one to take lightly, it is important to discuss what kind of long-term outcome can be expected for you or your loved one. For some patients, the tube is expected to be temporary while they recover from an illness. For other patients, the feeding tube may be expected to remain in place for the rest of their life. Whether or not this is appropriate for you or your loved one is the primary question. If you're a caregiver in a situation potentially requiring a feeding tube, you're loved one may have verbalized strong opinions on the topic, or they may have never mentioned their wishes for their long-term healthcare. If you are unsure of their wishes, using your best judgement—along with the opinions of the team providing care and potentially the advice of other loved ones—will be your guide for decision-making.